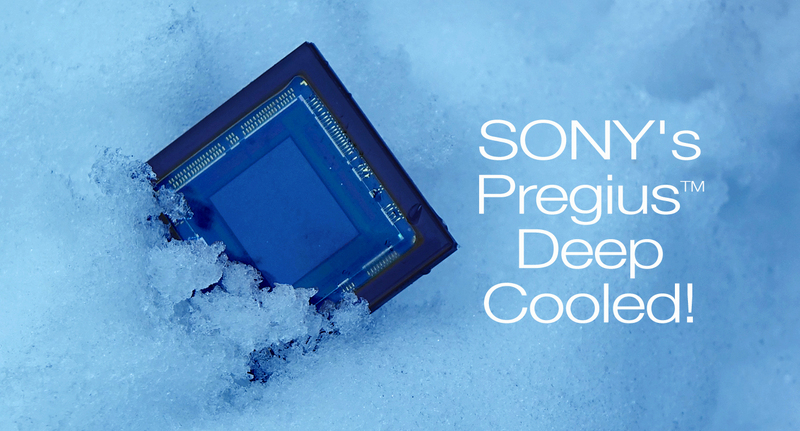 The Insight sCMOS Camera with the Sony Pregius™ sCMOS sensor is a leap forward in digital imaging technology. 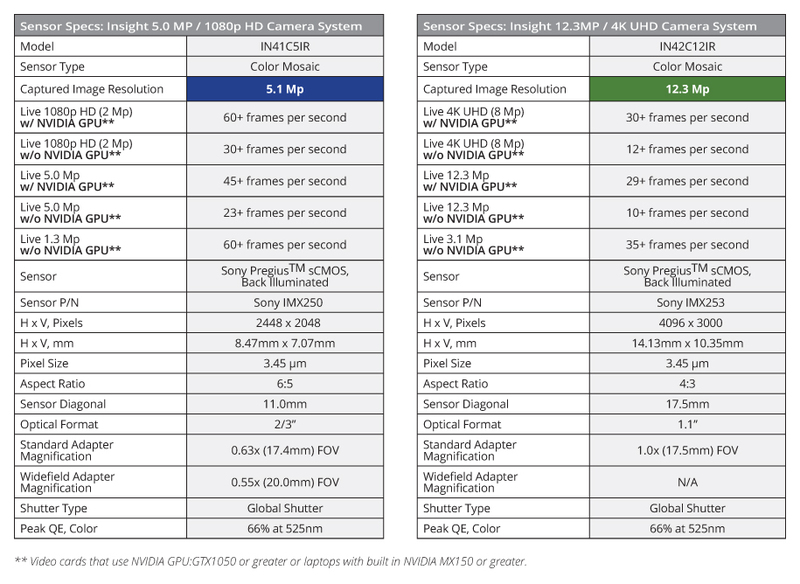 This new generation of affordable Insight sCMOS cameras delivers features previously found in much higher-priced cameras. The SPOT Insight sCMOS camera’s USB 3.0 interface and Sony Pregius global shutter work with our best-ever auto-exposure scheme in SPOT software to produce distortion-free, live image viewing of moving specimens at a fast, fluid 22 fps, at full resolution. The Insight sCMOS Camera combines low read-noise and high QE, furnishing sensitivity not previously seen in uncooled cameras. Many applications are supported due to the wide range of capabilities of the Insight sCMOS cameras, including live-cell, brightfield, histology, pathology, cytology and bright fluorescence imaging. Upgrade to… SPOT 4K UltraHD Plus! 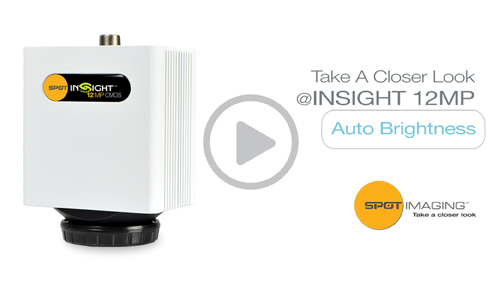 SPOT’s 4K UltraHD system takes you beyond fixed format 4K video presentations. It combines benchmark image quality, easy presentation tools and lets you present both live and captured images. It combines benchmark image quality, easy presentation tools and lets you present both live and captured images. Buying a fixed format 4K Video system is like buying an analog phone in the era of Smart Phones, it doesn’t make sense. 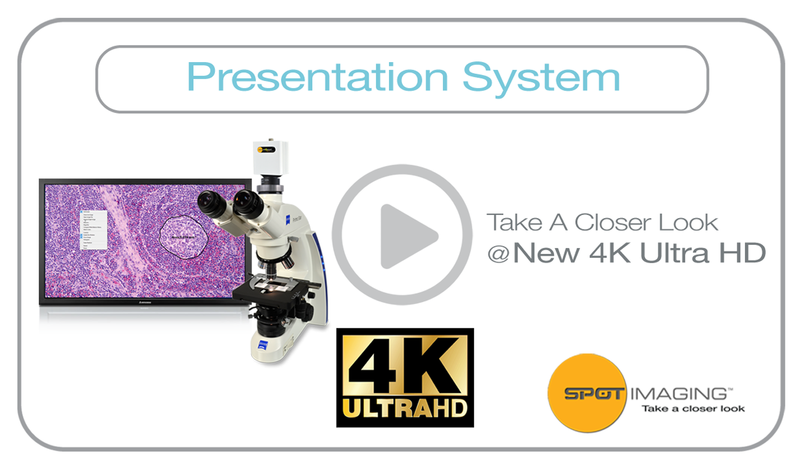 The SPOT 4K UltraHD imaging system provides convenient features to enhance your presentation in ways that fixed video system cannot. Video player requires a browser that supports HTML 5. 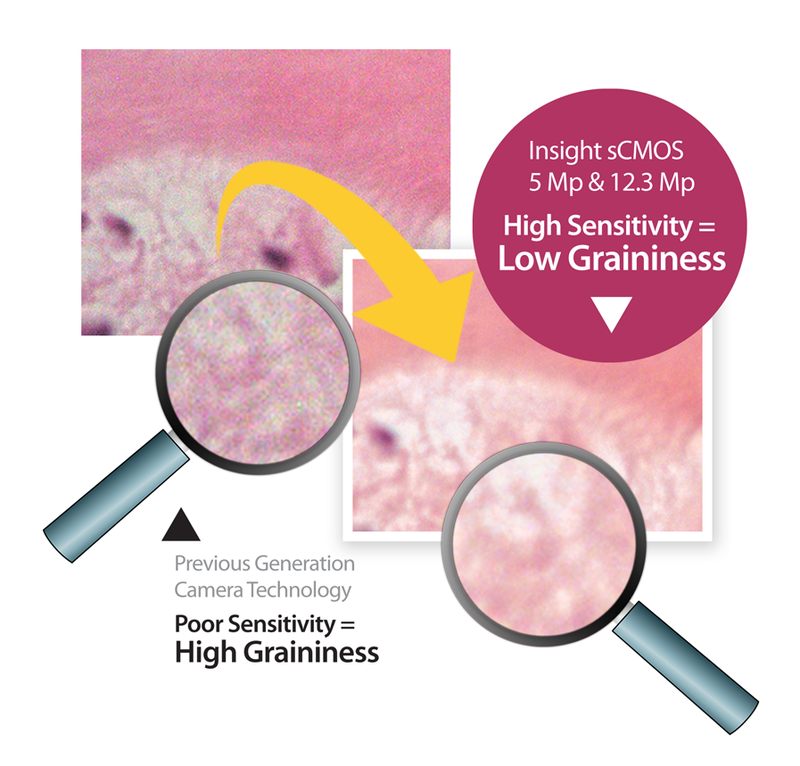 The new 12.3MP Insight camera has increased Microscopy Optimized Color Correction and Brightness with a high speed preview at 30fps, making magnified views of high power cell examination smoother and easier to read. Get Cleaner Images from Better Sensitivity! The quality of an image can be affected by the sensitivity of the image sensor and related electronics. Cameras with poor sensitivity will produce images that look Grainy*. SPOT Imaging has ushered in a new epoch for brightfield microscopy, providing real time, high detailed, displays of your samples. This capability has been achieved through revolutionary changes to the image sensors, camera electronics, graphics processing and computer interfaces. 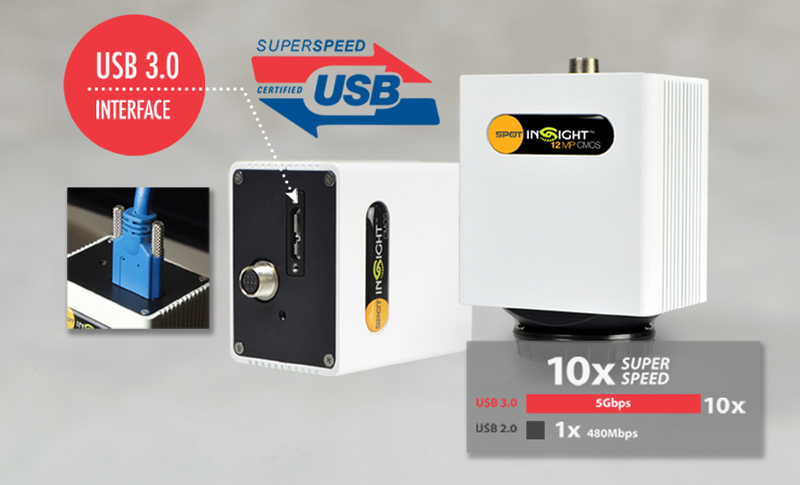 USB 3.0 adds the new transfer rate referred to as SuperSpeed USB (SS) that can transfer data at up to 5 Gbit/s (625 MB/s), which is about ten times as fast as the USB 2.0 standard. 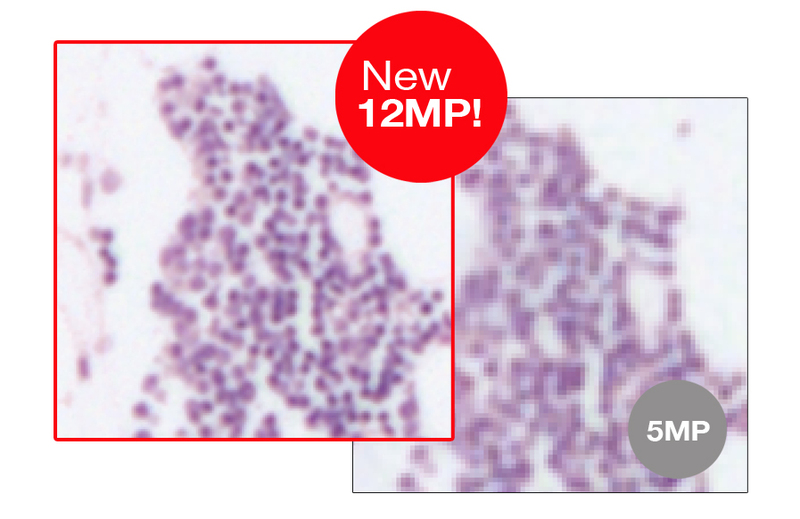 Now your lab can get your microscopy images Ten Times faster than USB 2.0! With the USB 3.0 Interface, you’ll also get universal connectivity to laptop and desktop computers! Raw captured images are limited by the physics of camera design resulting in errors reproducing what the eye sees. This is because the color curves of the camera do not match the eye. Correcting these curves can be done by a proprietary process, but the best methods have been developed by the International Color Consortium (ICC) which provides an international standard. This method allows manufacturers of cameras to produce a correction file that converts the raw color data from the camera to a color corrected output image. The quality of the results is dependent on what you optimize. 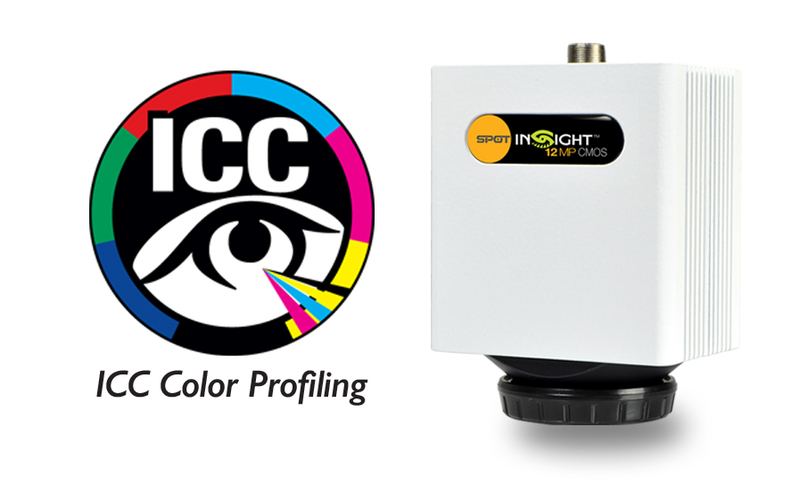 SPOT optimizes the ICC color correction files specifically for microscopy slides and the stains used to produce them. This takes extra effort, but we think you’re worth it. That’s why SPOT’s colors look so good. See the difference that ICC Color Profiling Makes! ICC (International Color Consortium) is the world standard for color management. 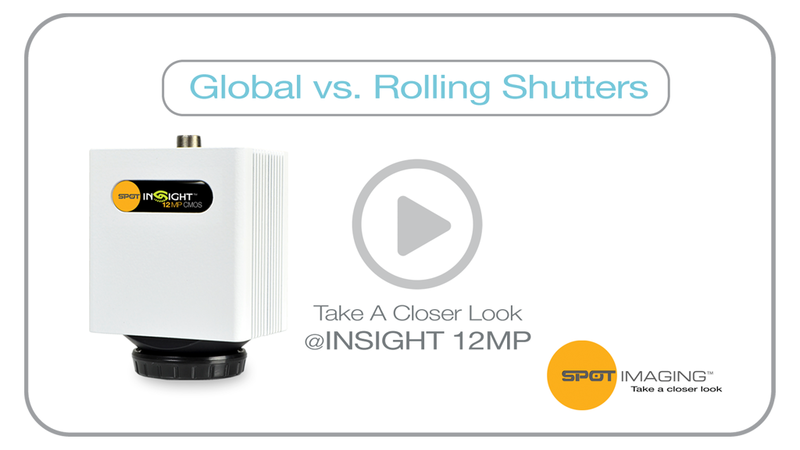 SPOT Imaging has optimized the Insight Camera’s ICC profiles for microscopy stains. 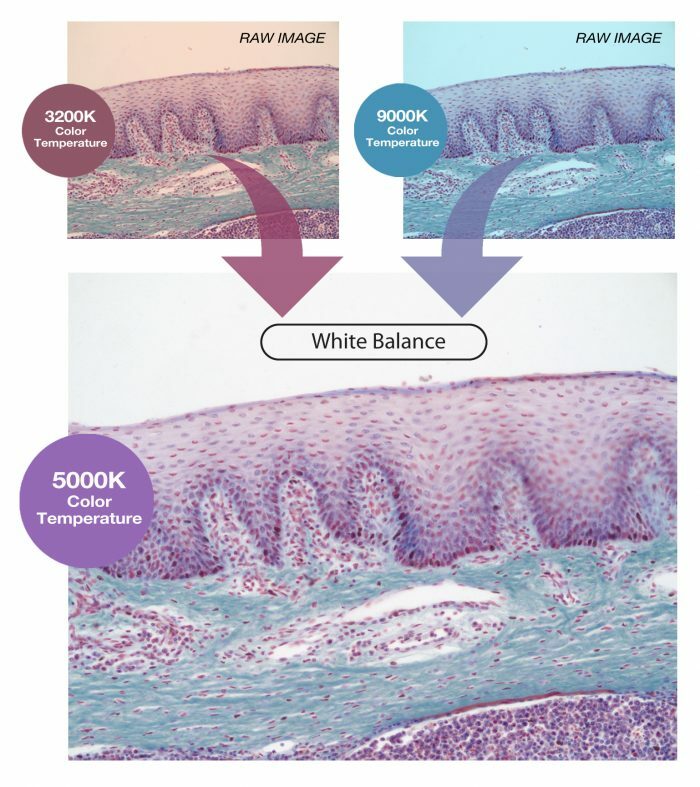 With SPOT ICC color profiles you get the best color possible from your microscopy imaging. Make a Lasting Impression with Outstanding Images! Even Illumination! See the Difference! Your images would be neutral white and evenly illuminated from corner to corner. In the real world, the color temperature of your illuminator will cast a hue on your images, generally blue or red. Additionally, the physical characteristics of the imaging system will cause the brightness and hue to vary across your image*. ( *-This results from structure in the light source, variance of light ray density in the condenser, angle sensitivity variance of the camera sensor… among many other factors that are part of the real-world physical components ). White Balance corrects the hue of your image by sampling white and adjusting the balance between the red, green and blue color channels and setting them equal**, hence the name “White Balance”. 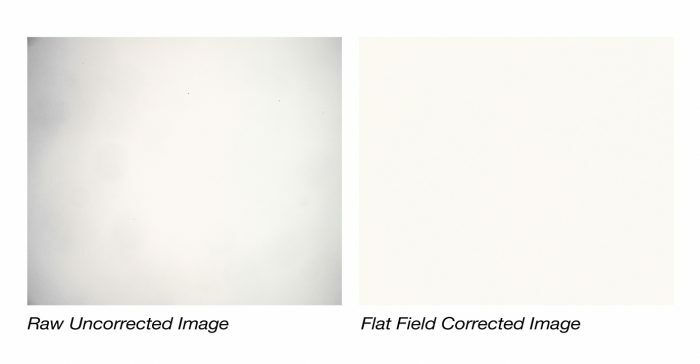 A Flat field correction samples a reference image at each magnification and calculates a correction factor for each pixel. The correction factor either boosts or attenuates the brightness of the pixel to match the average pixel value in the image. The result is an evenly illuminated final image. SPOT makes it Easy to Look Good! SPOT makes image correction an automatic part of your workflow ensuring your images leave a positive and lasting impression on your audience. Camera designs are the culmination of many decisions that balance performance and price. One of these decisions involve the type of sensor exposure shutter used- rolling shutter or global shutter. Reduce the cost of the sensor but introduce image distortion on moving specimens. 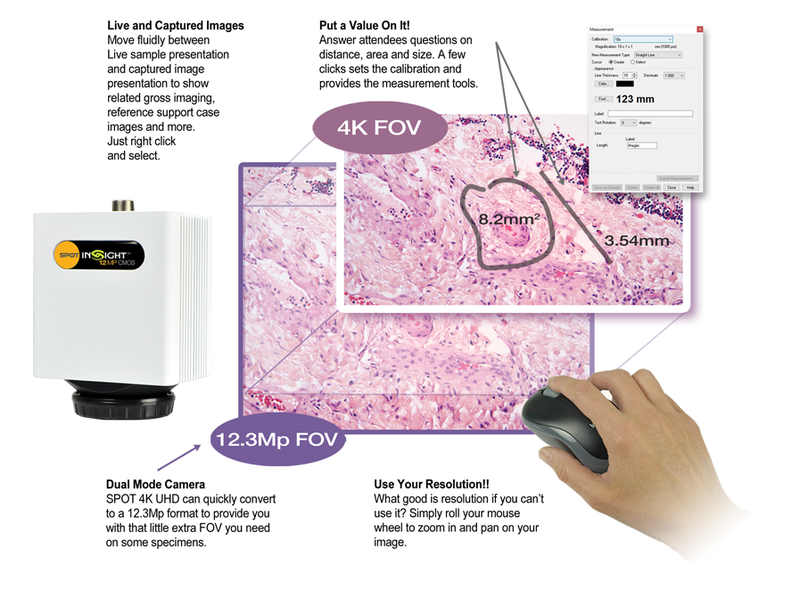 (see video below) This impacts applications where the camera is being used for live slide scanning such as classroom or tumor board presentations. 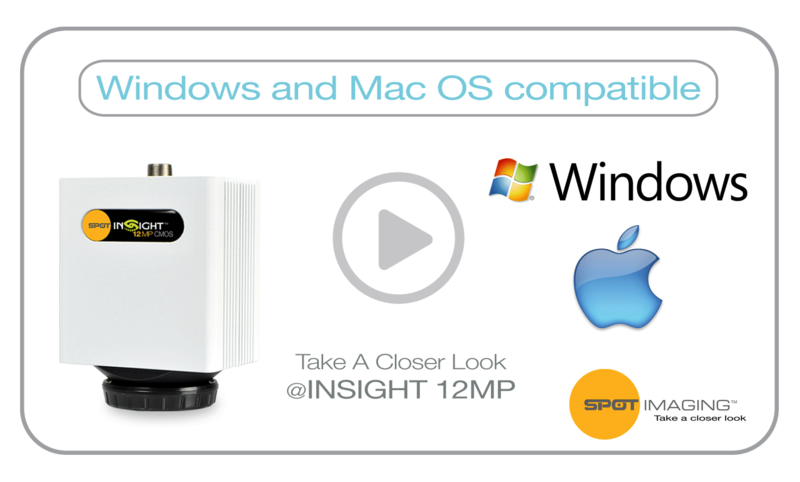 Insight sCMOS is Windows and Mac OS compatible! Most digital microscopy cameras are designed to work only on Microsoft Windows operating systems. Our engineers weren’t satisfied with designing our new cameras to function on only one computer platform, which is why our new line of Insight sCMOS Cameras are supported on both Microsoft Windows and Mac OS. Now no matter what system your lab is running, our new Insight sCMOS will run effortlessly to give the best microscopic images possible. An Intel-based computer running Microsoft Windows 7 (or later) or Mac OS X 10.8 (or later). 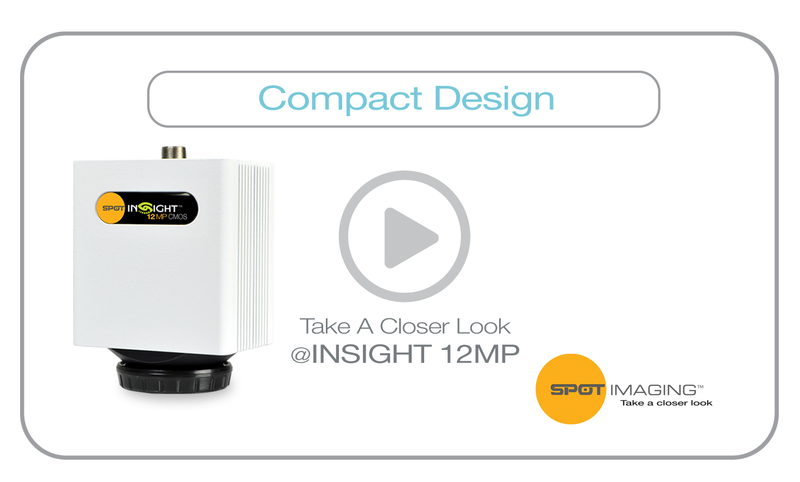 Where speed is of the essence, the compact SPOT Insight sCMOS camera is a perfect choice to complete any task in your lab, with live image frame rate up to 31 fps at full resolution. The additional benefit of USB 3.0 allows high speed data transfer and universal connectivity to laptop and desktop computers.